PiPO W1pro tablet is featured with Intel Z8350 processor, adopts with 14nm process, and up to 1.92GHz frequency, integrated 12 EU units Graphics 400 graphics processor, and also support 4K video playback. The PIPO W1 Pro 4GB RAM 64GB ROM metal shell back tablet uses a 10.1 inch IPS full view-angle screen, which will offer a better visual experience. 1200P screen resolution, fast response, uniform response speed, it is very suitable for watching movies. PiPO W1 Pro is pre-installed with genuine Windows 10 OS. This operating system is now widely used in daily office. Moreover, the PIPO W1pro 2-in-1 tablet package includes a fuall metal shaft magnetic docking keyboard and a standard digital pen, support 1024 pressure sense. 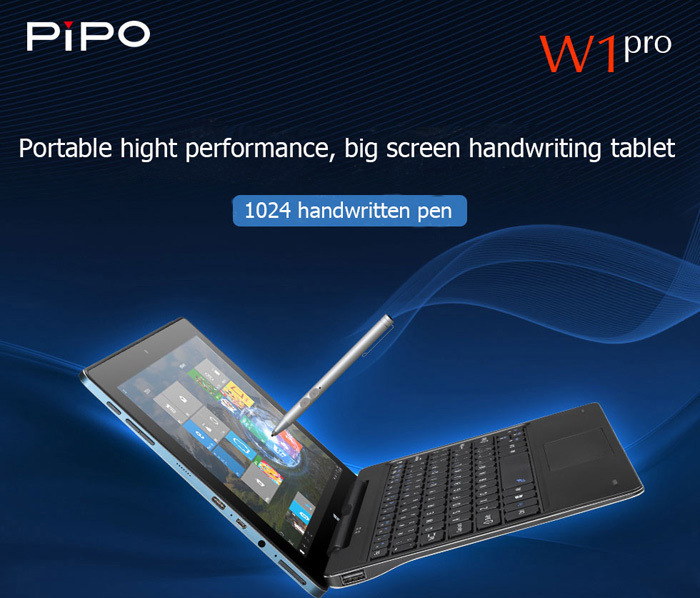 This PiPO W1pro handwriting tablet is now in stock and ready to send at PiPO-Store for $215.99, we support worldwide shipping and offer best customer service.